Home » All Forums » [Lunch & Dinner Forums] » Pizza » Best Pizza in Country? Helpful ReplyHot!Best Pizza in Country? Since I last posted in this thread I had a few pizzas around the country including the tomato and the white clam pies at the pizza mecca, Frank Pepe's in New Haven, CT. They were coal-fired pizzas which is a bit rare around the country. 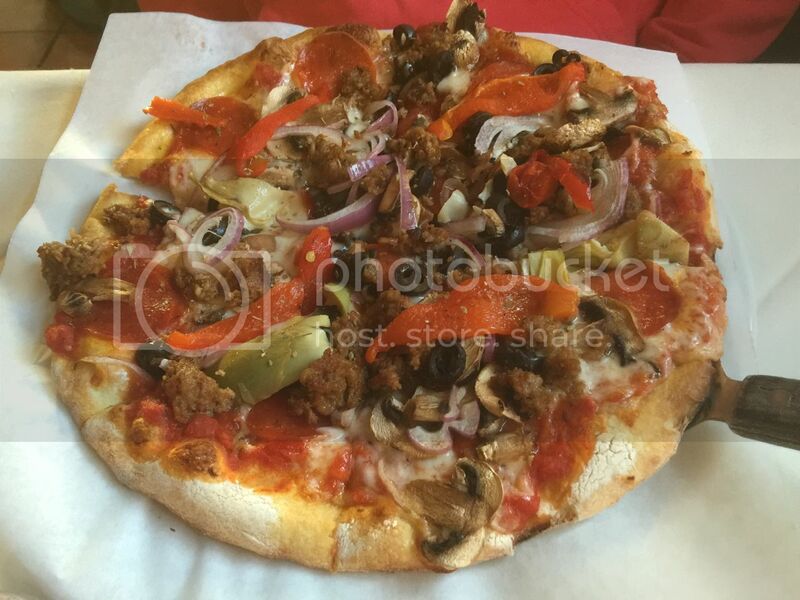 What has gained in popularity almost everywhere are wood-fired pizzas and a lot of them are very good. It is odd where you can find them. High on a mountain top, Mount San Jacinto to be specific in California, I found this in the little town of Idyllwild. This one had the best pizza crust I believe I ever had. This is the Fratello's Restaurant sausage pizza. Wood fired is rare here locally, but we have several coal fired. I prefer the wood fired pies. I ate one time at the late Bella Mia here in Cary. I would never presume to assert it was the best pizza in the country, although some posters in the Yelp link have. It was certainly the best pizza available around here. Here's a link to the best photo on Yelp. Check out that leoparding! When they started out, the oven was coal fired, and I was lucky enough to enjoy it while it was in its heyday. Later they switched to wood for the oven, didn't bring the excellence to the table, kept charging premium prices for a lesser product, and now they are deservedly history. It was a great loss to our area. I love Idyllwild. My favorite place there has nothing to do with pizza. It's the bakery. Had the best bread pudding ever there.... made up of everything that was left over from the day before. I'll have to try that pizza as it looks wonderful... and I haven't made the trip up the mountain in a few years. I'm not sure I'll go. C'mon, man...take one for the team! The pizza looks great but a $22 base price for a 16-incher strikes me as being to the high end of the scale. Is it a reasonable charge for Philly? $22 is not expensive, but even in the Northeast pizza country, it IS a bit steep. Unless you're in NYC! I'm not sure, but $22 may be the most expensive price for a plain (no-toppings) pizza in Philly. 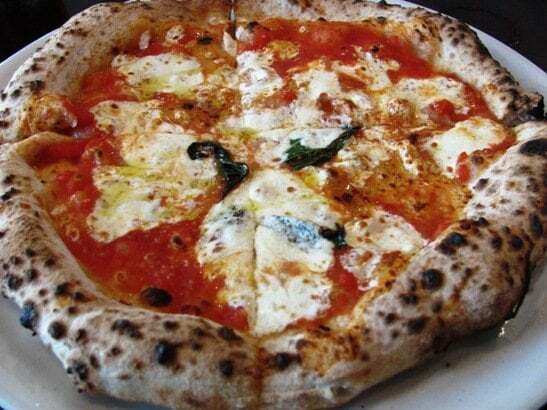 Most of the more gourmet pizzerias in the city charge less, but a lot of them only offer 12-inch pies (these are generally authentic, Neapolitan pies). When you factor in that Beddia makes 16-inch pies, the price is probably somewhat comparable. The colleague I do a lot of my lunch orders with, who is also into food about as much as I am, is very eager to try the new place. She never made it to the old location because she wasn't willing to wait on the sidewalk for a couple hours. I could wind up going with her at some point. According to this piece, it's not quite the same thing. The writer enjoyed his experience and the other items he tried. But he points out that it's not possible to be the same when you go from a one-man operation where the same individual makes every pie by himself to a larger operation where a staff helps make the pizza. Good read, and the author points out the potential pitfall of any artisan (especially in the restaurant business): working so hard at being the best in your field that it practically kills you. At least it sounds like the pizza is still very good, and Joe Beddia's life is maybe a little less unbalanced. His partners for this new restaurant are the people behind what may be the most raved-about restaurant to open in Philadelphia in the past few years; a place called Suraya, which is also in that heavily gentrified area. It's not a roadfood-style place and I haven't eaten there yet, but my mother has mentioned a desire to try it, so I imagine we'll eventually have a family outing there for someone's birthday or another special occasion.